The RCBS Rock Chucker is a rugged, classic design that can last a lifetime. If you are looking to get started with hand-loading, or just need another press for your reloading room, the Rock Chucker is a great choice. And now it’s easier than ever to purchase a Rock Chucker. Right now, Bullets.com has slashed the price on its RCBS Rock Chucker Supreme presses. 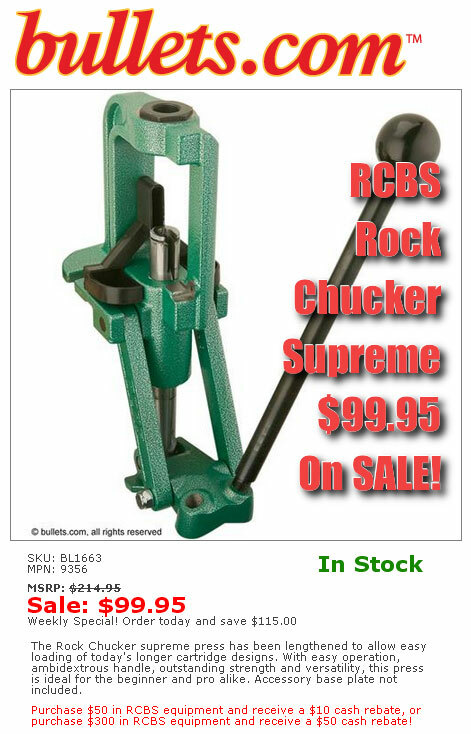 As part of an inventory reduction sale, Bullets.com is now offering the RCBS Rock Chucker Supreme (with full RCBS warranty) for just $99.95. Act soon — this offer is limited to supplies on hand. Getting a great press for under one hundred bucks is hard to beat. But get this — RCBS is currently offering a $10.00 rebate with any qualifying RCBS product purchase of $50.00 or more made before December 31, 2014. So… if you buy this press before the end of 2014, you can get a $10.00 RCBS rebate. That lowers your effective cost to $89.95 for the Rock Chucker Supreme. That is one amazing deal. CLICK HERE for REBATE INFO. Share the post "Awesome Deal: RCBS Rock Chucker Supreme for $99.95"
Editor: Sorry sir, that deal was in 2014 (see article date) and has long since expired. Check the Daily Bulletin every Monday for the latest Deals of the Week.